From Goodreads ~ Spenser smells corruption in a college town. Taft University's hottest basketball star is shaving points for quick cash. All manner of sleaze - from corrupt academics to hoods with graduate degrees - have their fingers in the pot. Spenser's search takes him from lecture halls to blue collar bars and finally into a bloody confrontation with almost certain death. 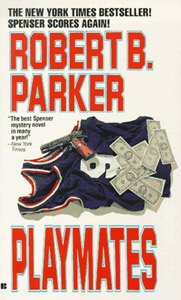 But Spenser saves an arrogant young athlete - even though it nearly kills him to do it. Spenser is a private detective in Boston. When the Taft University school newspaper reports a rumour there is point-shaving going on in the basketball team, Spenser is hired to find out if it's true. He determines that the star player, Dwayne, is doing just that. When Spenser confronts Dwayne about it, he discovers that Dwayne is illiterate but has a caring girlfriend. Rather than turn Dwayne in and ruin his (and the girlfriend's) future, Spenser instead decides to stop the people who are profiting from Dwayne's actions. This is the sixteenth in the Spenser series (there are currently 46, with the last six written by Ace Atkins after Parker's death in 2010). I've read many over the years (and have liked the series) and have started reading them from the beginning of the series. Though it is part of a series, it works as a stand alone. I thought the story was interesting with Spenser trying to protect a kid who didn't want to be protected, especially after Spenser kept stressing that Dwayne is an adult. I would have been inclined to let Dwayne take care of himself and accept the consequences of his actions, especially since Dwayne was involved in Spenser almost being killed. He wasn't grateful for anything Spenser did. I'm not a fan of Susan, Spenser's love interest ... she has become picky and princessy. Though Spenser and Susan have been together for about 15 years, they talk like teenagers about their relationship, which I don't find realistic given their age and how long they've been together ... "I love you." "I love you." "I love you more." "No, I love you more." "I can't imagine my life without you." "I can't imagine MY life without YOU."